Nicolas Poussin, one of France’s famous artists in art history spent most of his time in Rome where he influenced by Raphael, and Titian's rich, colorful, classical mythology. Poussin painted one of his famous paintings "The Abduction of the Sabine Women", in 1636/37. The painting has a strong triangle compositional format recalling Titian’s paintings and other High Renaissance artists. Confusing action is everywhere. Swords are drawn, a horse is rearing, and women are being snatched, but it isn't enough to create an emotional atmosphere, dwarfed by the overpowering plain Roman architecture in the background right. The red caped figure on the left and the diagonal composition isn't even enough to pull the viewers eye away from the building and the powerful influence it has on the atmosphere of the entire painting. Probably the most famous painting by Nicolas Poussin and totally different from the "Abduction", is "The Funeral of Phocion", 1648. Poussin has solved the problems in the earlier painting mentioned above. The name of the painting comes from an Athenian General who has been falsely convicted, executed for treason, and carried out along a winding dirt road. 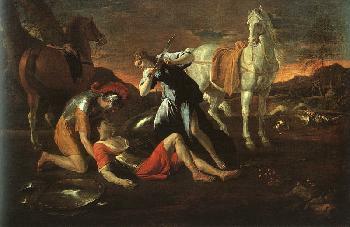 Nicolas Poussin's painting actually is not about the funeral and is not a story-telling device. "The Funeral of Phocion" is about systematic order. Poussin renders form after form, and detail upon detail, overpowering the composition itself into confusion and disharmony. In the end however, he is able to overcome preoccupied detail with using ordered serenity, a clear calm atmosphere, and easy viewer access into the landscape. Everything is adjusted pictorially, and is in perfect harmony, nothing is out of order, or unbalanced. The active dramatic immediacy of Rubens Baroque art is gone replaced by an ideal landscape. Painting mostly as he pleased and not in accordace with the regulated formula of the Academy, Nicolas Poussin painted "Et in Arcadia Ego", in 1655, returning to the High Renaissance style of Raphael and Titian. His composition represents a time long lost in idyllic innocence and grace. A shepherd points to the inscription on the tomb "Et in Arcadia"(Even in Arcadia I am). Death is even in the peaceful dreams of Arcadia. Other famous artists of the Baroque art history Period are Anthony van Dyck and Diego Velazquez.